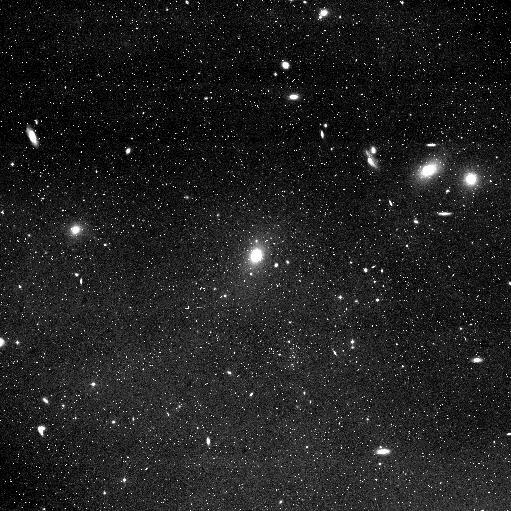 Our image shows the central portion of the Virgo Cluster of Galaxies, centered on the giant elliptical M87, as it appears in the visible light on long-exposure photos with large telescopes. To the right (west, preceding) edge of the image, slightly above the middle, the bright lenticular (S0) galaxies M84 and M86 are visible with a bunch of faint galaxies around them; this conspicuous group is so appealing that it is often photographed; look at our image collection. This group is described with M84, and contains the edge-on spiral NGC 4388 (mag 12.2), starlike NGC 4387 within the triangle, dim edgewise NGC 4402 above M86, the barred spiral NGC 4413, and NGC 4425. Left (west) of M86 follows Markarian's Chain of galaxies, which stretches well to the top (North) center of our photo, and beyond to M88 which is just beyond the edge of our image. The chain starts at M84 and M86, next is the appealing interacting pair of NGC 4438 (below) and NGC 4435, followed by 12.4-mag elliptical NGC 4461 and small companions, NGC 4473 (type E, 11.7 mag) and NGC 4477 (type SBa, mag 11.8). Right and above NGC 4477 is the 11.9-mag elliptical NGC 4459, and just on the edge and slightly left one can see suggestions of the 12.9-mag elliptical NGC 4474. The well visible galaxy below M84, in the lower part at the right edge, is the barred spiral NGC 4371 (type SBa, 12.1 mag), while the considerably bright galaxy in the right part of the lower edge is the heavily inclined Sa spiral NGC4429 (11.7 mag). Slightly left and well below M87 (so left of the lower middle) is the 12.8-mag galaxy NGC 4503 (classified "E" by Vehrenberg). Situated left (west) of M87 is the E0 elliptical M89, and below it edge-on NGC 4550. Above and left of M89 is the magnificient spiral M90, below and just on the edge of our image is barred M58. Along the right edge below M58 occurs 12.1 mag elliptical NGC 4564, and the interacting pair of spirals NGC 4567 and NGC 4568.